This past July, participants of the 2018 OpenPlant Forum went on an expedition where they discovered several new species of plants. 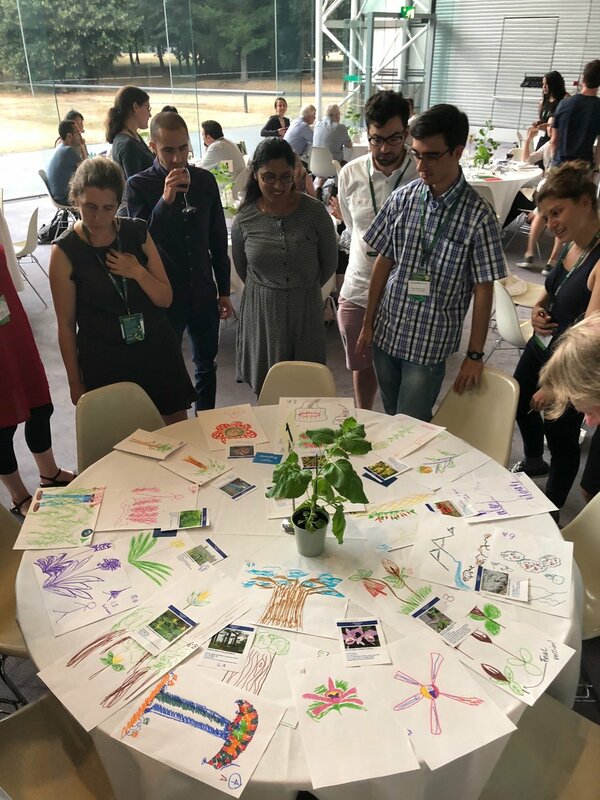 Ok- they didn’t REALLY discover the plants, but they played a game that enacted the discovery of 18 new plants, from alpine to outback, at the conference dinner held at the Sainsbury Centre for Visual Arts (SVCA). The game, “Postnatural Botany” was inspired by Medieval Bestiaries, and the notion that explorers would describe the wildlife from their travels to people who had never seen such wildlife, as a means to share with the community. Image courtesy of Rutgers University Honors College Instagram and Julia Buntaine. 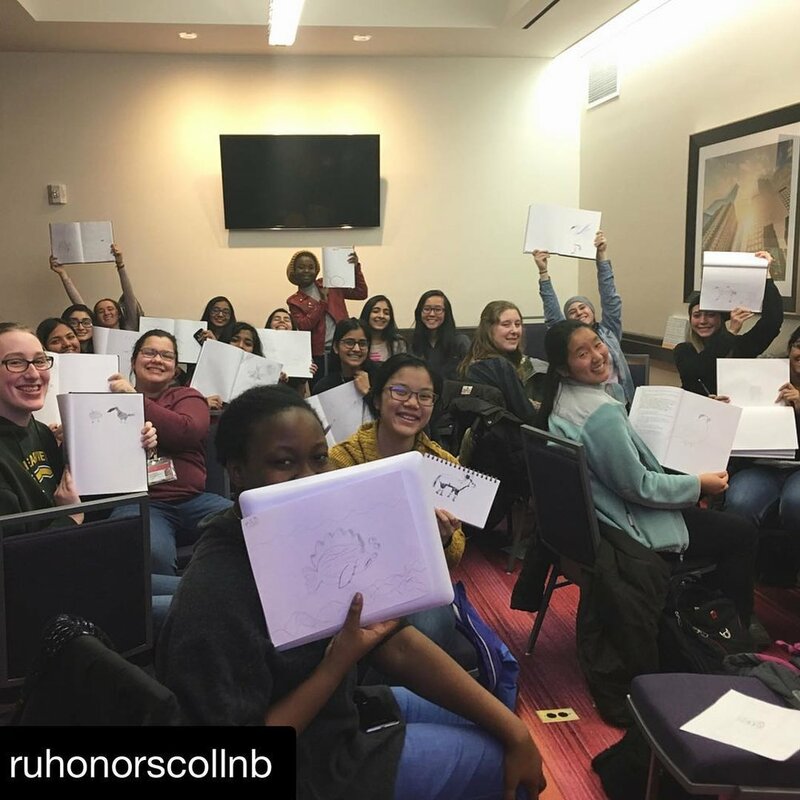 “Postnatural Botany” has its origin as a workshop I created for 23 students in the Rutgers University Honors College and Douglass Residential College for women. The workshop took place in early 2018 and was part of a course, “Science/Art/Technology in New/York/City" taught by Julia Buntaine of the SciArt Center. Originally dubbed “Postnatural Bestiary” and depicting a wide array of animals, I worked with Dr. Nicola Patron from the Earlham Institute to tailor the game to be plant focused, specifically for the Open Plant Forum. The 2018 Open Plant Forum was hosted in Norwich, at the John Innes Centre. Norwich–which enjoyed great prosperity in the Middle ages–was the perfect backdrop for a game based on medieval bestiaries. Each person was assigned a role as an “explorer”, “artist”, or “regulator” and worked in teams to produce artworks of each plant according to the rules of play. 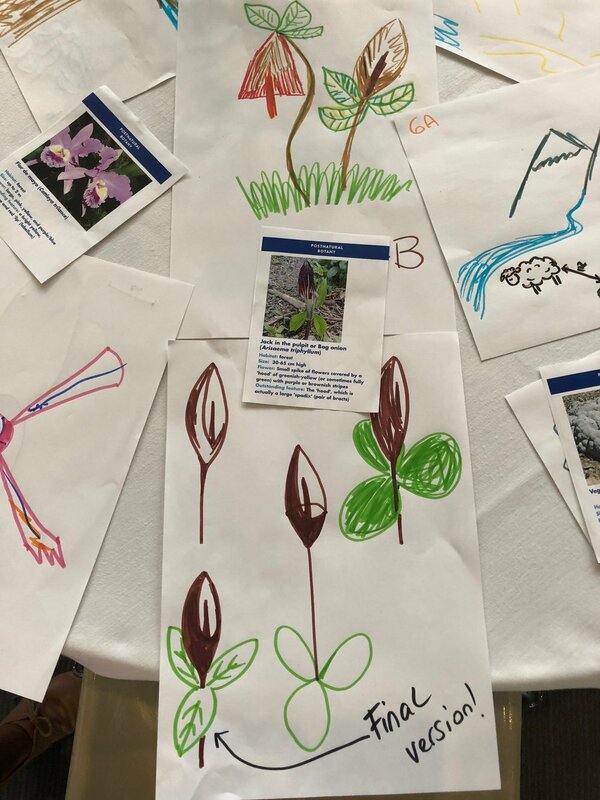 Patron selected a wide variety of plant life; Venus Flytrap, Rainbow Eucalyptus, Welwitschia, Jack-in-the-Pulpit, and Java Moss were all “discovered”, described with limited terminology and depicted with magic markers and imaginative minds. The “explorer” in each group was given an envelope that contained a card with the plant they had “discovered.” The card displayed a limited amount of information, including an image of the plant, the name, habitat, size, characteristics of its flower (if there was one), and information about a specific “outstanding feature” for each plant. The “explorer” had to describe the plant they had discovered to an”artist” for visual interpretation. A “regulator” was also part of the game play, in order to ensure all parties followed the rules, of which there were many! Neither the artist nor the regulator were allowed to guess what the plant might be. The artist was not allowed to talk at all, primarily to keep them from guessing what the plant was. Simple explanations, gestures, analogies referencing common household objects, an abbreviated list of plant traits (stems, leaves, flowers, roots), as well as a few select domesticated plants were used in favor of scientific terminology. The key objectives of the game were not so much to depict the plant correctly, but to work as a team: to communicate carefully on the part of the explorers, and to listen and interpret on the part of artists and regulators, and for everyone to have fun with plants. The term “Postnatural” is defined as any organism altered by humans via selective breeding or genetic engineering. In the fable of this game, the plants and organisms are newly “discovered” by humans. Through the ages, plant collectors took their findings to new places for breeding and growth in new environments, altering the genetics and epigenetics of the plants forever. This calls to question, at what point of human intervention do organisms become “postnatural”? Once an organism is known and it is integrated into our lexicon; in a Bestiary as it was in the Middle Ages, domesticated to produce products for humans, or its genome sequenced, it is part of our human narrative. Fewer and fewer botanists get to experience the thrill of discovering a new plant species. And yet, through the discoveries of modern biology, humans are experiencing a new kinship with other organisms as we learn more about common biological processes and origins of life on earth. The gameplay of “Postnatural Botany” relies on observation, communication, listening, and interpretation; tools that we can all use to examine the potential impact of this kinship. Once a month something amazing happens at the London Science Museum, and last month our collaborative team from OpenPlant, the SAW Trust, the University of East Anglia (UEA) and graphic recorder Rebecca Osborne, got to be part of it. On the last Wednesday of every month, the London Science Museum opens its doors late into the evening to welcome adults to an engaging and free evening out, as part of the Science Museum Lates. Each evening is themed around a different science topic, attracts around 4,000 guests per night and offers a relaxed atmosphere where you can walk around with a drink in hand whilst talking science. This month’s theme was ‘The year of the engineer’ and we brought the synthetic biology edge to the night with our ‘Engineering Natural Products’ stand. With the help of Dr Richard Bowater (University of East Anglia), Hannah Griffiths (John Innes Centre) and of course DNA Dave, visitors were taken on a journey from the discovery of DNA through to how scientists engineer biological systems. 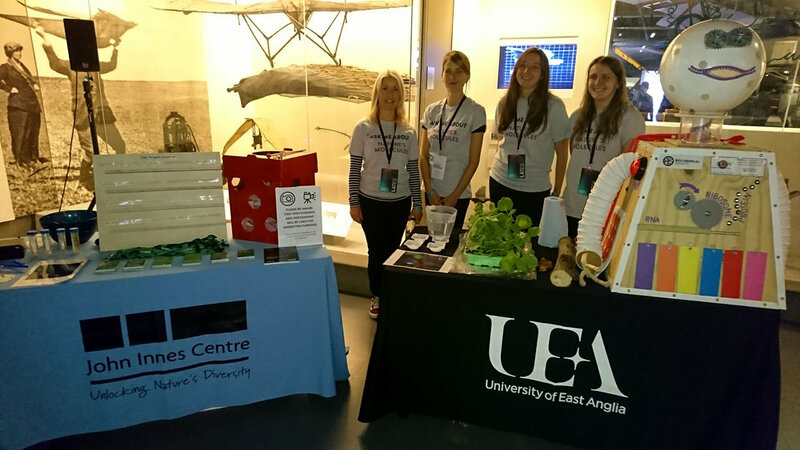 Our enthusiastic public engagement volunteers, Jenni Rant and Sami Stebbings (SAW Trust) and John Innes Centre PhD students' Hannah Griffiths and Shannon Woodhouse. Our stand told the story of avenacin, a triterpene that is found in the roots of oat plants and helps make the plant resistant to fungal diseases. By understanding how these plants produce avenacin from the instruction in their DNA, we explored how scientists can engineer other biological systems to mimic their production. For example, can we transfer these genes from oat plants, into other crops, such as wheat which have no natural antifungal protection? Guests had a plethora of activities to take part in, from our ‘Fishing for DNA’ activity, Avenacin Pathway puzzle, to getting up close and personal with an avenacin molecule using VR. They also had a chance to get hands on and infiltrate tobacco plants and see fluorescing oat seedlings! With a steady stream of people throughout the night, the evening was a great success (not only because there was gin bar)! A massive thank you to all our collaborators who helped pull our stand and activities together, as well as the fantastically organised, London Science Museum team. In was a great event to be part of and we hope to return to another Lates event sometime in the future! Following last year’s success at BoomTown Fair, we returned, alongside the SAW Trust, with an Alice In Wonderland themed delight for the senses, with science, art and writing activities to excite young minds. Table laid and ready for the first guests to arrive! Now in its tenth year, BoomTown Fair attracts up to 60, 000 people and many of those came to visit us at Kidztown, with its impressive visual displays and interactive activities for families. Our stand entitled “The Mad Hatter’s Tea Party” revolved around workshops which had four stations for the children to rotate around. The tea parties began with the mad hatter revealing secret invisible ink messages to the children before the experiments could begin! The children were tasked with many exciting science-based activities. Tasty treats the children could create included sweet, fizzy sherbet and rapid ice-cream made using an endothermic reaction and flavoured with plant flavourings (vanilla, coconut and strawberry). In addition to these, there were also many pigment-based activities inspired by all the bright colours in Wonderland, for the children to try. Including; natural plant pigment tissue tie-dyes and colour changing flowers and celery. The results of which decorated the tent throughout the weekend. Carrying on with our use of plant products, the children also got to create their own fruit flavoured jelly balls, using alginate gelling agent, derived from algae, to go with a fizzy drink! The final activity for the children was to write secret messages, which would be revealed by a new set of children, at the next tea party by the Mad Hatter. Some of our tea-party guests about to make sweet treats. As well as the tea parties, there were also numerous activities and challenges for the children to engage with while the table was re-set. These activities included using microscopes to explore the microscopic world Alice enters when she shrinks, writing nonsense poems, like those the Mad Hatter recites at his tea party and pinning the grin on the Cheshire cat. We had a range of craft activities available, providing the children with something to take home with them from their time at BoomTown. The children could make Wonderland inspired flower faces, clock necklaces, a Mad Hatter’s Hat and playing card bowties. Across the three days the children were able to immerse themselves in a Wonderland of science, art and writing, feeding their curiosity with a range of thrilling experiments and allowing their creativity to run wild with exciting craft projects. A big thank you to the entire team who helped with the preparations and running of “The Mad Hatters Tea Party” and to BoomTown for having us once again! PhD student Camilla Stanton spent a three month internship, from May to August 2018, working with OpenPlant to build resources and materials for the Synthetic Biology for Schools (SynBio4Schools) project, funded through the OpenPlant Fund scheme. In this blog post she describes the project and the work that she completed during her placement. Synthetic biology brings together researchers from a broad range of backgrounds to solve biological problems through rational design. While synthetic biology is increasingly being taught in universities, it remains under-represented in the national curriculum and teaching resources for GCSE and A-Level students. The SynBio 4 Schools project aims to solve this problem by creating a comprehensive educational resource package that teaches the principles of plant synthetic biology through practicals and case studies. I got involved with the SynBio 4 Schools project through a 3-month industrial placement as part of my PhD. My role was to assess and identify what resources could be included and to begin compiling them. An obvious starting place was to explore the activities and demonstrations that researchers in Norwich and Cambridge had already developed and tested. While these resources are valuable on their own, bringing them together creates a set of interlinked resources that support one another, greatly increasing their reach and impact. It is also an exciting opportunity to get contemporary research into schools, helping inspire the next generation of biological engineers! During my placement, I worked in collaboration with researchers to discuss ideas for how their research could be used in a teaching-style activity, whether that be an experiment, worksheet or craft-based. We also had discussions about what sort of supporting material might be useful, such as articles, interviews or case studies. It was a really enjoyable process as it gave the scientists a unique opportunity to think more creatively about their work, and I got to hear some really innovative ideas for teaching some quite complex concepts. 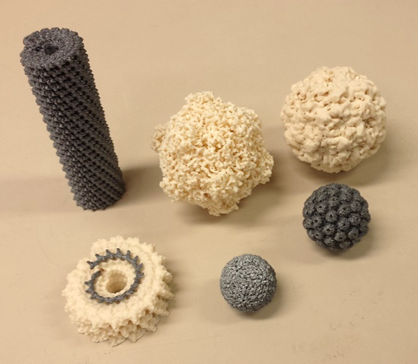 Some of the 3D printed virus structures from Roger Castells-Graells' OpenPant Fund Project. I ended up focussing on writing up three activities based on work carried out by Dr Paolo Bombelli (plant microbial fuel cells), Dr Nicola Patron (genetic circuits) and Roger Castells-Graells (virus structures), which I was lucky enough to showcase at the OpenPlant Forum. This gave me the chance to receive feedback from other researchers and educators about how the materials could be made more accessible for students and provide more support for teachers and technicians. These suggestions helped shape the basic write-up template, which now includes additional investigations, sources and links to other experiments. This was a hugely valuable experience for me - I got to explore new topics, meet people with exciting and original ideas and even got to try my hand at some design work! Although I’m now back doing my PhD, the SynBio 4 Schools project definitely doesn’t end there - we want as many people as possible to get involved. Synthetic Biology and the Senses at Cambridge Science Festival, March 2018. The morning shift: Some of the Cambridge Science Festival 2018 team ready for doors open. 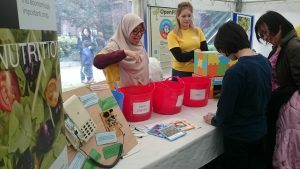 For the third year in a row, OpenPlant teamed up with the SAW Trust and Cambridge Synthetic Biology SRI to deliver a variety of activities on our interactive stand at the Cambridge Science Festival. While braving the icy ‘pest from the west’ we explored some of the natural products made by plants with those who dared to venture out in the chilly weather. In keeping with this year’s festival theme ‘making sense of our world’, our ‘Synbio and the senses’ stand enabled participants to extract their own plant pigment, learn how plants make proteins and meet the one and only DNA Dave! 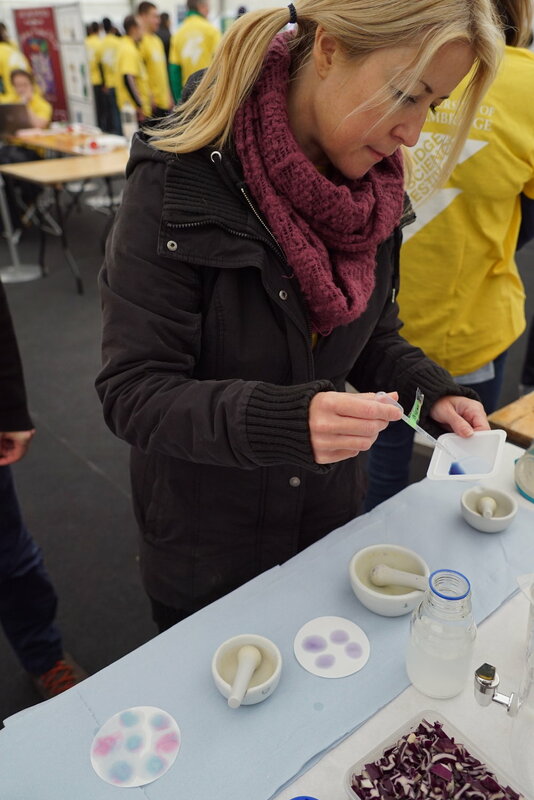 The main activity of the stall involved visitors extracting the anthocyanin pigments from red cabbage, getting hands on with a natural pigment and investigating its sensitivity to pH levels. Children and adults alike, seemed to have great fun pipetting out their cabbage juice, acid (lemon juice) and alkaline (bicarbonate of soda solution) onto discs of filter paper to create their own artworks. Visitors were excited to take home a worksheet explaining the science behind the pigments, and giving instructions for doing their own extractions and experiments at home. You can find the worksheet here. Colour Bio-factories - using genetic engineering to boost existing pathways within plants to produce natural pigments. 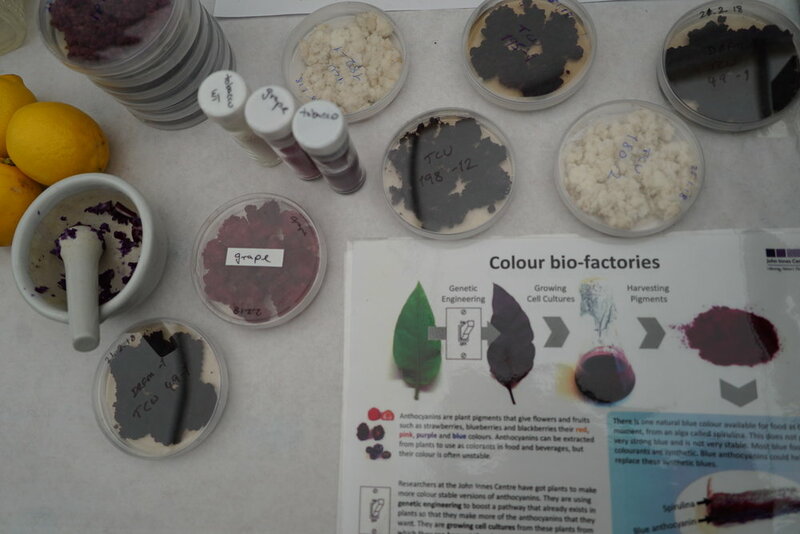 In addition to the pigment extraction, visitors could learn about how researchers in Cathie Martins’ lab at the John Innes Centre are now producing these anthocyanin pigments in plants, using genetic engineering to boost a native pathway. At present there is only one natural blue pigment that is available for food colouring, which is produced from an alga called spirulina. However this blue is not very strong or stable in colour. Therefore, most blue food colourants are chemically produced synthetic compounds. The research conducted by Dr Ingo Appelhagen in the Martin lab is enabling the discovery of new, more stable, anthocyanins found in nature and the use of plant cell cultures to produce these more stable forms in larger amounts so that they could be used as non-synthetic colourings. They can generate a range of colours, including bright blues. Visitors were also able to have a go at putting together their own synthetic biology plant system with the use of an interactive jigsaw game in which they chose a plant species to work with, a site or organ of the plant where they could make something happen, and a signal that would cause it to happen. To complete the game, they could then learn how proteins are made from the instructions in DNA with the help of DNA Dave! DNA Dave is a robot whose mechanics describe the processes of “transcription” and “translation” through which DNA is copied, then read and translated into a protein. As with previous events, DNA Dave was an absolute hit with all the visitors, including his namesake – Sir David Attenborough! Participants were even given the chance to design their own protein that could be used by DNA Dave. A young visitor to the Cambridge Science Festival designs her own protein. DNA Dave helps to explain the production of proteins. With visitor numbers reaching 1600 in our marquee alone, the day was a great success with lots of enthusiastic individuals - if a little nippy! A big thank you to all our volunteers from the University of Cambridge and the John Innes Centre, Norwich, who helped on the day and did a great job! BoomTown Fair is an annual music and arts festival held in Winchester. It attracts up to 60,000 people a year. The festival hosts a wide range of performances across its many stages, providing visually impressive themed areas on-site. This is also the case with Kidztown, the diverse and interactive family area. OpenPlant and the SAW Trust were key contributors to the Kidztown science tent. Children here were introduced to different natural plant-based products in a fun and engaging way. This included a carefully devised potion-making, craft and spell-writing stand. 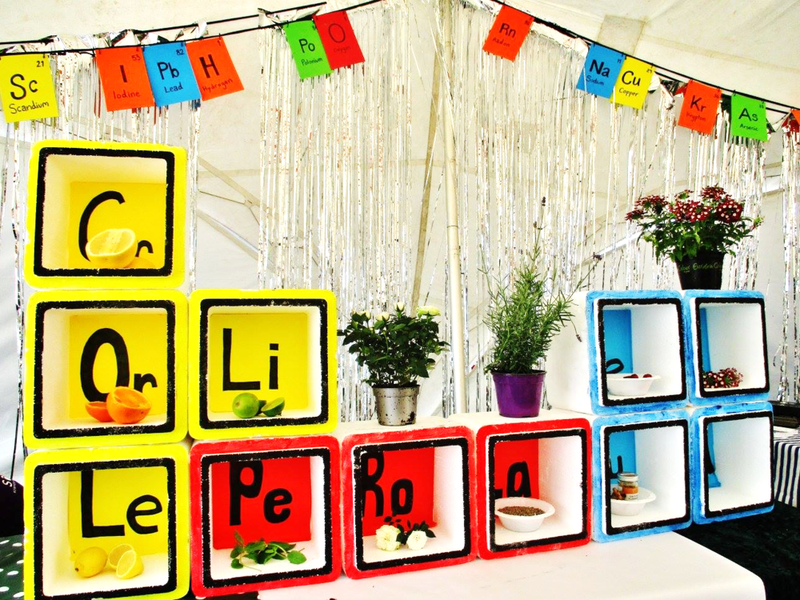 The stand, titled "Marvellous Medicines," revolved around our periodic table of natural products. The children were tasked with making a magical potion, picking just one component from each block of the periodic table for their ingredients. The blue block contributed a plant material that would provide the colour pigmentation for the potion, including the magical element of colour change in different pH solutions. The red block contained plants with appealing scents, extracted as essential oils, to give the potion a delightful smell. Finally, the yellow block contained citrus fruit. The citric acid in this can be used to observe the colour change. 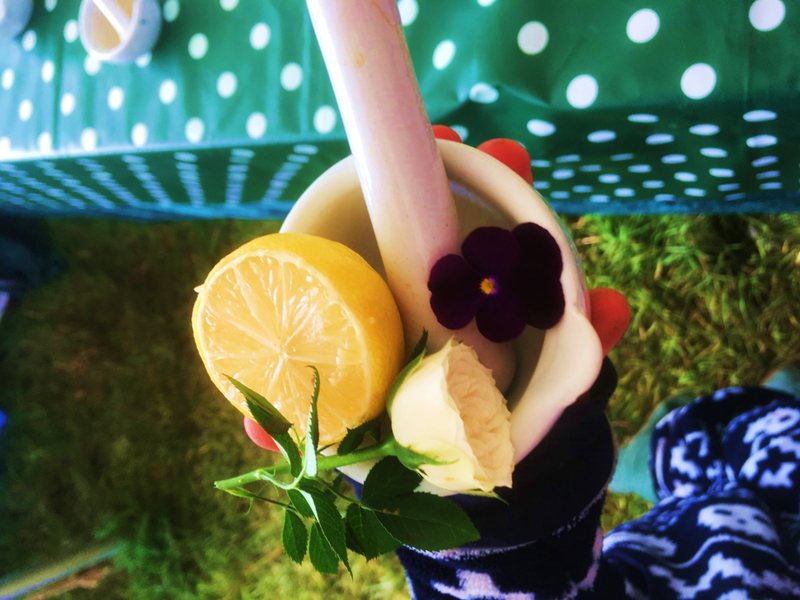 Once the children had selected their ingredients, they ground up the blue item (either red cabbage, berries, turmeric or selected flowers) using a pestle and mortar. They then practised using pipettes, adding 75 percent ethanol to extract the pigment. This was transferred to their potion flask. They next added the essential oil corresponding to their red item and 1 millilitre of bicarbonate of soda solution to observe the first colour change. Last of all, 35 millilitres of citric acid solution was added to create the final colour of their potion. It was explained that citric acid was the compound in citrus fruit that made it taste so sharp. Whilst a slight fizz was observed upon adding the citric acid, due to it reacting with the bicarbonate of soda, only a very small amount of the bicarb was present. The final step involved adding a green slime of more bicarb mixed with washing up liquid, which caused the potions to fizz over and release the essential oil smell. If the kids wanted an extra colourful potion they also added food colouring gel. Artist Molly Barrett helped the children create their own artistic potion bottle, cutting out bottle shapes from cardboard and sticking dried plant products to them. Our writer Ali Pritchard asked the children to think about what they wanted their potion to do, and they wrote a spell to cast over their potion for it to work. This was written on acetate and stuck to their art creation. Throughout, the children learned about a plant’s ability to make different compounds that define their features such as colour, scent and taste. They extracted the colour pigment themselves and used other natural extracts to complete their potions, observing how we can use things that plants make for our own products. The older children also learned about pH and colour indicators, a classic chemistry practical they will no doubt carry out in secondary school. A further use for plants was discovered in the art stand: the plant materials could be used as 3D elements to decorate the potion bottles. The children let their creativity run wild by imagining what their natural product potion could achieve. 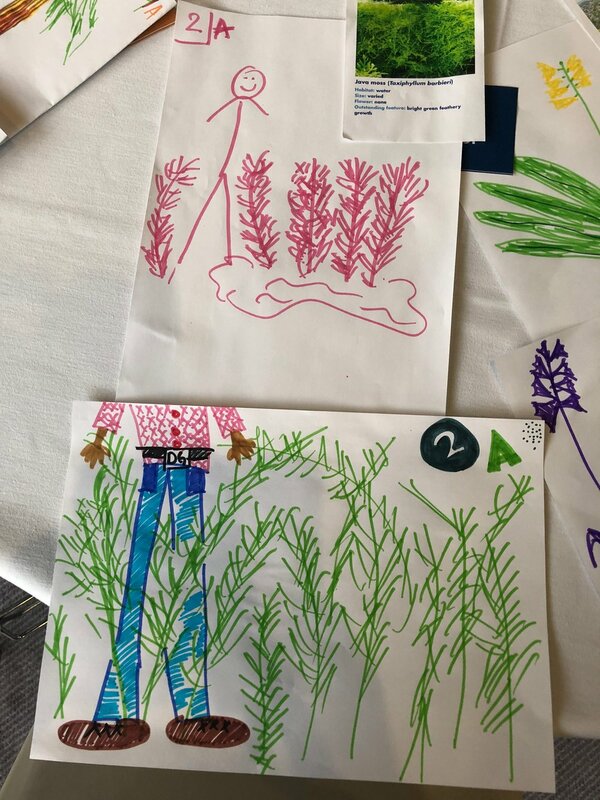 Whilst compounds produced by plants may not be able to turn glitter into gold or the sea into Ribena, hopefully the children took away the idea that many of the compounds produced within plants can be used in ways they previously hadn't thought about. Not least, the children had lots of fun exploring ideas around magical plant extracts and many of the children returned to the stand later on. Marvellous Medicines couldn’t have been a success without the hard-working team, who over three days helped the children through all the tasks. A big thank you goes to the team and to BoomTown for having us! Guest blog from Emma McKechnie-Welsch, a PhD student from the John Innes Centre who spent three months doing an internship in Science Engagement with OpenPlant and the SAW Trust. My name is Emma and I am a PhD student working in the Cell and Developmental Biology department at the John Innes Centre. 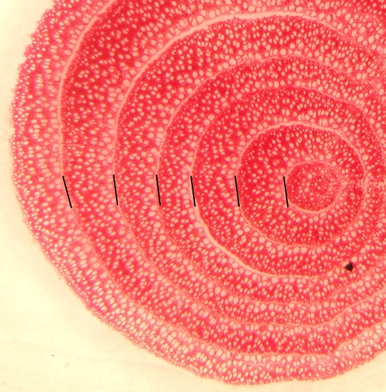 My research looks at genes functioning to facilitate controlled plant growth and development from the shoot apical meristem in Professor Robert Sablowski’s research group. My PhD funding from the BBSRC includes a three month work placement and I was keen to gain experience in science communication and outreach so arranged a joint placement with OpenPlant and the SAW trust. On my placement I had the opportunity to design two SAW projects to discuss science relevant to my research with primary school children at Tunstead primary school. For the year 1/2 class I worked with writer Julia Webb and artist Lara Nicole and the aim was to get children thinking about the functions of different parts of a plant. For the year 5/6 class I was worked with writer Mike O’Driscoll and artist Chris Hann with a day themed around plant evolution. We used scientific images at the start of the day to catalyse inquisitiveness about the science we were going to explore, and provide inspiration for the poetry and art sessions. Image credit: PiccoloNamek, shared via Wikimedia Commons under CC BY-SA 4.0 licence, https://commons.wikimedia.org/w/index.php?curid=528340. Image credit: Donald Macauley from Carshalton, Surrey, UK - Bee Orchid Uploaded by Amada44, CC BY-SA 2.0, https://commons.wikimedia.org/w/index.php?curid=24915600. Image credit: Kim Findlay, John Innes Centre. Shared via NRP image library, under CC BY 4.0 licence. Image credit: SKsiddhartthan, shared via Wikimedia Commons under CC BY-SA 4.0 licence. Image credit: Stefan.lefnaer, shared via Wikimedia Commons under CC BY-SA 4.0 licence, https://commons.wikimedia.org/w/index.php?curid=56785572. To start off the lesson we played a “build a plant” game to get more familiar with the main parts of a plant, their function, and what plants use from their environment to grow. Each child also put a cut flower in coloured water to think about the use of the stem. Then the children were given a selection of fruit and vegetables and asked to decide what part of the plant each came from. They were given a flower to look more closely at the reproductive parts and think about how seeds are formed by pollination. Finally, they looked at different types of seeds in a seed kit and we discussed the different types of seed dispersal tactics plants use. The children dissected plants to look up close at the reproductive parts under the microscope. We began by guessing the number of different plant species on earth and the children suggested why plants are useful. In groups, they were given cards representing each component of photosynthesis and had to arrange them to think about the process. 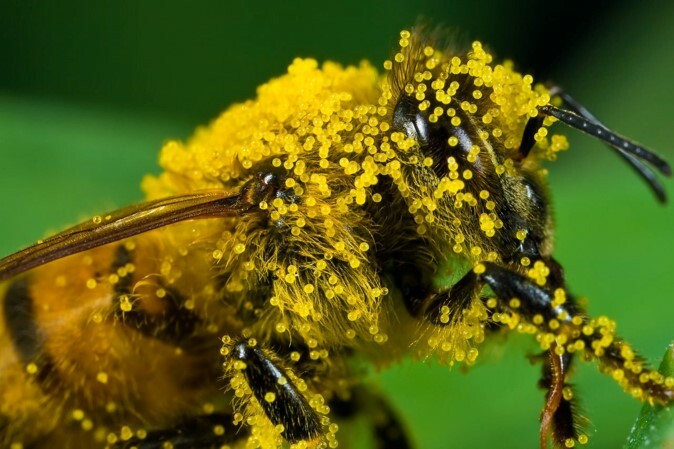 We covered pollination and its importance for increasing genetic variation. The children dissected plants to look up close at the reproductive parts under the microscope. I covered different types of seed dispersal and the importance of varying environmental conditions for evolution. Then children carried out DNA extraction from strawberries after learning a bit about what DNA was and how important it was in controlling the appearance of the plant, with a single mutation in a gene coding region potentially greatly changing this. Following on from DNA extraction there was a game to match the numbers of genes to different organisms. The children really engaged with the scientific learning aspect of the day which was great. Lots of the children thought about the questions I asked to the classes and gave insightful answers, as well as wanting to ask questions throughout the lesson/ activities. When asked about their favourite part of the day, at least half the children listed specific sections of the science morning. The poems produced by the year 5/6 children really showcased the children’s interest in understanding genetics and how growth and development of organisms are controlled. The younger children were enthusiastic about looking at different types of seeds, bringing back different types they had found in their school grounds at break time to show me. It was great for them to think about the different stages of growth a plant goes through from seed to eventually producing a flower, including difficulties different environmental conditions could cause, while writing their poems. The children were really excited about getting to do an afternoon of art although the activities designed weren’t quite as expected. The art didn’t centre around drawing on paper but producing 3D art pieces. The younger children gave lots of personality to their individual hand puppets and used them to help communicate their poetry whilst the older children focused on the scientific pictures provided and gave interpretations of pollen and seed dispersal, as well as the protective mechanism of the cactus. From this experience, I could see how integration of science with writing and art can help children associate science more closely with creative thought, rather than a regimented, inflexible learning process, which makes the subject inaccessible to some children. The teachers were impressed with the pieces the children managed to produce and the level of thought about scientific processes they reached, which I think was largely down to the different approach to education SAW days take. Guest blog post by Roger Castells-Graells about his OpenPlant Fund project “Accessible 3D Models of Molecules”. Roger recently won a UEA Engagement Award in recognition of the work he has done both with OpenPlant and beyond. My name is Roger and I am a PhD student in Prof. George Lomonossoff’s lab at the John Innes Centre in Norwich. My research project is about the production of virus-like particles to understand viral dynamics for future applications and to generate new bionanotechnological tools. I have a passion for science communication and public engagement and I have had numerous opportunities to communicate my science in Norwich, the UK and abroad since the start of my PhD. My OpenPlant experience started in September 2016, when I attended a great Co-Lab workshop organized by the Open Science School and funded by an OpenPlant Fund. With this opportunity I had the chance to interact with scientists from different fields and also with designers and artists. It was an enriching experience and we developed a project called VRICKS (Virus Bricks) that aimed to generate tools to explain viruses in educational ways, like for example with paper models. Following up from this workshop, in October 2016, I organized an activity for the Norwich Science Festival, together with Jenni Rant (The SAW Trust) and Colette Matthewman (OpenPlant), where we recreated the assembly of proteins into a virus protein coat using materials like paper and plastic, which represented the subunits of the virus. The public contributed to the assembly of a virus model, they learnt about related research from the Lomonossoff lab and they took home a build-at-home model. Over one hundred people participated in the activity during the weekend, making it a roaring success. Following up with the interest to build tools to explain biological processes, such as virus assembly, I decided to apply for and OpenPlant Fund with the project “Accessible 3D Models of Molecules”. The project team is a multidisciplinary team (molecular biology, bioinformatics and engineering) of students from JIC and University of Cambridge and with this fund we are developing models of viruses and proteins using 3D printing technologies. Recently I presented some of the virus models in a high school with students aged 12 to 16 years old. The students enjoyed being able to handle and compare representations of real virus structures and were amazed that some of these structures were only discovered this year. When the school teacher was asked about how the use of educational 3D models in the classroom could benefit the learning process he answered that first of all it creates excitement and focuses the attention of the students. It is something completely new! It contributes to the understanding of three-dimensional models and gives the students a better sense of the reality of the object. Furthermore, it allows the students to calculate scale as it is possible to touch, measure and compare different models. I was invited to speak at the Pint of Science Festival in Norwich in May, and gave a talk entitled “20000 Leagues under the microscope: Viruses & Nanomachines”. 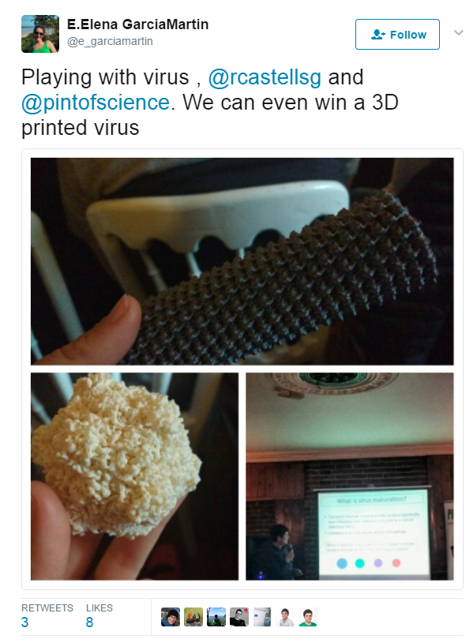 At the event, I passed around several models of 3D printed viruses and the public loved having the opportunity to handle them. It was a great experience and we received really positive feedback. I want to thank the organizers of Pint of Science for such a great event! As a result of all of these activities, I was recently awarded a UEA Engagement Award 2016/17 for contribution to Public & Community Engagement, which I am very proud of. With thanks to my supervisor Prof. George Lomonossoff, OpenPlant and all the people that have helped, encouraged me and opened up opportunities in this last year. In May 2017, the Pint of Science festival returned to Norwich. The festival, which is held over a few days, was a huge success, with many events being sold out days in advance. Each event offers the audience the chance to meet scientists at their local pub and discuss their latest research in an informal and welcoming atmosphere, whilst sipping on their favourite pint. Two sell out events where those of OpenPlant Project Leader Professor George Lomonossoff and his PhD student Roger Castells-Graells, and a second event with OpenPlant’s Norwich-based Director, Professor Anne Osbourn. George’s talk was entitled ‘Just Eat Your Greens – A New Way of Vaccinating?’ and took place at the York Tavern. It covered the use of a highly efficient transient expression system developed in his laboratory. This Hypertrans® system allows for the relatively quick and cheap production of large quantities of virus-like particles in plants, which have been proven to be effective as experimental vaccines. Roger presented ‘20,000 Leagues Under the Microscope: Viruses & Nanomachines’ taking the audience on a journey into the nano world of viruses. 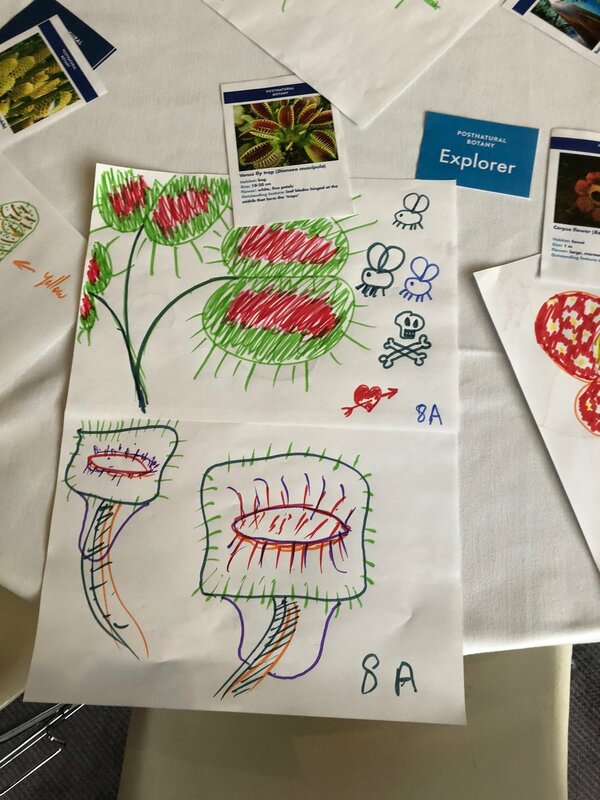 During the entertaining talks, the audience took part in various activities such as making a virus molecule out of pipe cleaners and creating virus inspired sketches on beer mats. The following evening, Anne took to the stage at the St Andrews Brewhouse to present her ‘Finding Drugs in The Garden’ talk. Anne’s inspiring talk invited people into the plant kingdom to hear about its very own chemistry toolkit. She presented her teams current work harnessing the DNA that encodes the pathways to these chemicals and using them to produce designer molecules for medicinal, agricultural and industrial applications. For the scientists taking part in the festival, it has proven to be a great platform on which to reach the public to talk about their research and build an understanding of their work within the local city of Norwich. After such well received talks and events, we very much look forward to the return of the Pint of Science Festival in 2018. Cambridge Science Festival Stand 2.0 – Improved Design! A family discover how proteins are made following instructions in the DNA, with the help of Nadia Radzman and DNA Dave the robot. In 2016 we designed a new stand for the Cambridge Science Festival and were delighted with the excellent feedback and the award won by the plant and life sciences marquee where our stand and team scored exceptionally highly with a 94.3% public approval rating! We decided to build on the game we had developed, using cardboard boxes, which explains the process of transcription and translation into something bigger and better (and more professional!). We applied for an Outreach Grant from the Biochemical Society to enable us to work with a designer to realise our ultimate game and were delighted to be successful! In December 2016 a group of enthusiastic scientists met with designer Molly Barrett to begin work. Scientists Ioannis Tamvakis and Nadia Radzman provided excellent ideas for representing the scientific process, and coding an arduino to build in the electronic outputs we wanted and then the build began and at the beginning of March we were introduced to DNA Dave, the robot! We were very excited to give Dave his debut at the 2017 Cambridge Science Festival and we were not disappointed! The public were really keen to see what the robot could do and the process of transcription and translation of DNA to proteins was very well explained by operating Dave’s buttons, cogs and switches. We will be taking Dave to future events and he is also available for hire! You can follow his travels on Twitter using #DNAdave. The team celebrate the end of an excellent day. The Plant and Life Science Marquee at the coming Science Festival will be running 10:00-16:00 on Sat 18 Mar 2017. There will be a 'Synthetic Biology and the Senses' joint exhibit by OpenPlant and the SynBio SRI. We will be including exhibits on synthetic biology and the senses, with interactive puzzle games and activities for children, as well as posters of various projects going on in Cambridge relating to synthetic biology. We are looking for volunteers to help with the exhibit and presentation of the stall. We require volunteers for various times of the day and would be very happy to have 4 people at the exhibit at all times. One hour slots are available and volunteers can stay as long as desired. Roger Castells-Graells showing off the 80-sided virus structure built with the creative help of lots of kids at Norwich Science Festival. In October 2016, Norwich hosted its first ever two-week long science festival. The event was a huge success and attracted an estimated 100,000 visitors. One weekend was dedicated to showcasing research from the Norwich Research Park, entitled ‘solving problems with science’ and the local OpenPlant team took the ‘Power of Plants’ stand that was originally designed and run at the Latitude Festival earlier in the year. We were joined for a day by Dr Katrin Geisler from the University of Cambridge to highlight the 'Power of Algae'. In addition to this, we were joined by John Innes Centre scientist Roger Castells-Graells who brought his new project ‘VRICKS’ that was created at a recent OpenPlant Co-Lab interdisciplinary science design workshop. This extra activity fitted well alongside the hypertrans plant expression system game which used the example of making flu vaccines in plants. The concept of VRICKS is a resource for building 3D virus structures to explore the biology and the geometry of viral organisms. However, for the festival we wanted to draw on the strengths of people power to build a giant virus structure where everyone who visited the stand was able to make one piece! Working together to plan and deliver at public events is a great team exercise for scientists to think about how best to translate their research using practical tasks and accessible dialogue. Taking time to explore your work with the public builds understanding and trust in the value of research and is particularly rewarding to do in your local city. We are very much looking forward to the 2017 Norwich Science Festival! A moment of calm checking the exhibit before the public arrive. Synthetic biology applies design and engineering approaches to biology, and promises to contribute solutions to pressing global challenges. The success of this highly interdisciplinary field depends not only on skills as diverse as molecular biology, computer modelling, engineering, social sciences and design, but also an ability of individuals to build bridges across disciplines. The Synthetic Biology for Schools project aims to bring together a set of activities and resources to enable school groups and science clubs to explore the synthetic biology space. Read more about the project below. I invite you to join the meeting at 4.30pm on 7th October at Cambridge Makespace. Maybe you already have educational activities and resources that can be shared and fit into this context (including, but not limited to molecular biology, engineering, standards and modularisation, circuitry, computer modelling, responsible research and innovation). Maybe you are interested in developing new synthetic biology learning resources, or maybe you are interested in new activities that you can use to engage school pupils or the public. This meeting coincides with the Co-Lab Big Making Weekend run by the Open Science School so that people from this event can also attend. Please check out their event pages if you would like to get involved in some of the ongoing projects. There will be a second meeting and 1-day hackathon in Norwich in November (date TBC) for those who wish to join. It will not be essential to attend both meetings. Project Overview Synthetic biologists in Norwich and Cambridge and collaborators from the Open Science School, The SAW Trust, and Universidad Catolica (Chile) are working on several ideas for developing educational materials, tools and practicals to bring multidisciplinary science and synthetic biology into schools. Some of these resources are already in development. In addition, open hardware is being created that could be used by schools to support practicals in this area. While each of these resources are valuable on their own, by bringing them together there is an opportunity for increasing their reach and effectiveness, and therefore their overall impact. In this project we propose to i) identify relevant activities, resources and amterials and bring them together into a comprehensive set to explain the principles, tools and applications of synthetic biology; ii) develop video and infographic materials that provide a context for these resources; iii) bring together key stakeholders and facilitate discussions with potential end users, and; iv) identify routes for dissemination and create an action plan to maximise their use. The outcome will be a complete package of activities, supporting information and hardware that can be successfully used in schools to introduce synthetic biology with a focus on plants, and to provide learning opportunities across a wide range of disciplines. Our intention within the scope of this project is to target the resources for schools in the local area, but we are also looking at national and international opportunities for dissemination. Initially we are looking at targetting school groups and science clubs from GCSE level on, but we will keep an open mind about target groups as there may be opportunities to pitch the resources towards different groups such as undergraduates, DIY bio communities and the general public. This project is funded by an OpenPlant Fund mini-grant. The Plant and Life Sciences Marquee was a roaring success at Cambridge Science Festival, scooping a prize at the Cambridge BID awards Awards 2016. OpenPlant's synthetic biology stand was highly rated by the public mystery shoppers and got a special mention in their final report! OpenPlant offered a glimpse into synthetic biology at the Cambridge Science Festival and also showcased open technologies for science by demonstrated open source hardware developed with support from the OpenPlant Fund and SynBio Fund. A disassembled phone explained the idea that by knowing how each of the individual simple components work (a dialling pad to input your desired number, a vibrating receiver coil to change the electrical signal into a sound wave) you can build more elaborate systems and by applying this idea to biology the public made weird and wonderful new lifeforms like a cat whose nose turns purple when a disease is nearby or a sprouts that taste of strawberries when it snows. 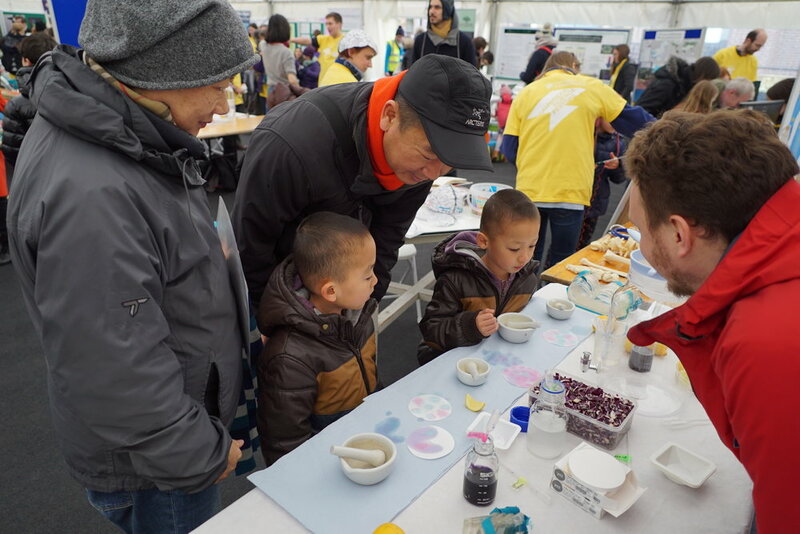 Cambridge Science Festival conducted some ‘Mystery Shopping’ as part of its evaluation strategy in 2016 and our home, The Plant and Life Sciences Marquee, was one of several weekend, hands-on spaces that were visited by evaluators. Our stand and team scored exceptionally highly with a 94.3% public approval rating! The marquee was honoured at the 2016 CambridgeBID (Business Improvement District) Awards and Elisabeth Burmeister of the Sainsbury Laboratory collected the award on behalf of all the volunteers and sponsors who made the event a success. Congratulations to all of the OpenPlant and SynBio SRI student and Faculty members involved! The Plant and Life Sciences Marquee was a roaring success at Cambridge Science Festival, scooping a prize at the Cambridge BID awards Awards 2016. OpenPlant’s synthetic biology stand was highly rated by the public mystery shoppers and got a special mention in their final report! The marquee was honoured at the 2016 Cambridge BID (Business Improvement District) Awards and Elisabeth Burmeister of the Sainsbury Laboratory collected the award on behalf of all the volunteers and sponsors who made the event a success. 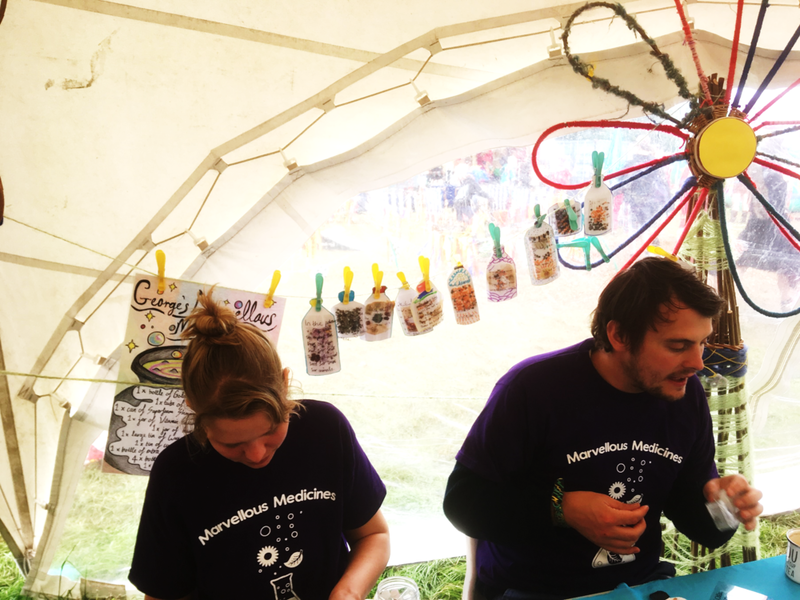 A team of OpenPlant Scientists from the John Innes Centre, the University of Cambridge, and collaborators from Imperial College and University College London worked together to deliver an exciting range of activities for families visiting the Kids Area at Latitude Festival in July 2016. Latitude is a mixed arts festival that attracts over 10,000 visitors a year, who enjoy the rich mix of thought-provoking performances and interactive workshops. Our stand, entitled ‘The Power of Plants’, was an exhibit that led visitors on a journey looking at traditional uses of plants, how plant selective breeding has produced the food crops that we recognise today, tracking the evolution of our relationship with plants through science to introduce the synthetic biology approach, and some of the modern uses of plants and algae that bioengineering enables. Activities included leaf printing to explore variation in the brassica family, a pairs game to match modern crop varieties to their ancient ancestors, pigment extraction and making bath bombs to explore traditional uses of plants and the chemicals they produce, infiltrating tobacco leaves (with water) to learn how scientists introduce new DNA into plants and to discover how vaccines can be made in plants. The second half of the display focussed on algae and visitors learnt about algae and it’s many uses (including the variety of algae-derived pigments used in food), seeing an algae printer in action (created by designer Marin Sawa), learning about bioreactors and measuring algal cell density using a mobile phone app (both bioreactor and app were developed as part of the OpenPlant Fund project: Big Algae Open Experiment), and learning about the difference between a lemon battery and electric currents produced by algae and plants. We exhibited both plants and algae that had been wired up so that the current could be measured with a volt meter. We had a hugely positive response, both to the science exhibited and to the aesthetics of our stand which was covered in plants, algae bioreactors, science related graphics, and fronted by 5 beautiful giant willow flowers created by Mat Rant, and decorated by the OpenPlant team. Our stand even smelt good, thanks to the 100s of lavender bath bombs that were being made. Though the smell at times became a little too much for our volunteers who had to step out of the tent for some fresh air and a coffee to counter the sleep-inducing effects of the lavender! A Big Algae Open Experiment blog post can be found here. Colette Matthewman (OpenPlant, John Innes Centre, Norwich), Jenni Rant (The SAW Trust, Norwich), Alys Barr (OpenPlant, John Innes Centre, Norwich), Michael Stephenson (OpenPlant, John Innes Centre, Norwich), Dorota Jakubczyk (O’Connor Lab, John Innes Centre, Norwich), Matt Heaton (John Innes Centre, Norwich), Daisy Rant (Norwich), Paolo Bombelli (Big Algae Open Experiment, University of Cambridge), Brenda Parker (Big Algae Open Experiment, University College London), Marc Jones (Big Algae Open Experiment, John Innes Centre, Norwich), Marin Sawa (Algal printer, Imperial College London), Katrin Geisler (Smith Lab, University of Cambridge). In March a team from the John Innes Centre brought the premise of synthetic biology to the public. As an annual event growing every year Cambridge Science Festival attracts people from across the city to learn about new developments in science and technology. Stall activities ranged from the extraction of DNA from Strawberries (University of Cambridge) to investigating evolution first hand with primate skulls (Wellcome Genome Campus). OpenPlant’s stall featured a glimpse into synthetic biology. A disassembled phone explained the idea that by knowing how each of the individual simple components work (a dialling pad to input your desired number, a vibrating receiver coil to change the electrical signal into a sound wave) you can build more elaborate systems. You can then use this concept in a biological setting. Firstly you understand how genes work, then you break these into smaller components each with their individual job, for example a sequence to tell you when to switch on a biological system. Finally this can be combined in a living organism to produce a desirable trait. At the Science Festival, the public used this idea to make weird and wonderful new lifeforms! A cat whose nose turns purple when a disease is nearby. Useful for medical diagnosis? Or how about sprouts that taste of strawberries when it snows, which many would no doubt relish at Christmas time? Or a personal favourite provided by one dad – a plant whose leaves turn gold when you water it. Obviously most of our new inventions that day were unlikely, no matter how much scientists persevere with them; I think a money tree is still a few years off. But the solid basis for such work is undertaken in laboratories throughout the world, and the public were undoubtedly positive about synthetic biology. Although everybody (well apart from a young girl who wished to use squids to inflict harm on unsavoury characters) was clear that it should be only used for good and moral solutions to problems. The OpenPlant team was able to stress ethical procedures are in place for this which many found comforting as sometimes the public can find scientists secretive at best. The Cambridge Science Festival is a vibrant, thriving and free event. Not only do people gain a glimpse of the developments in science but it’s also rewarding to the scientists giving up their time to share their knowledge and discussing their subject area. And synthetic biology is a hot topic which everyone should be talking about. Above: Nicotiana benthamiana by Aymeric Leveau (JIC), image NRP-103: licenced under CC-BY 4.0. As part of a workshop for post docs on ethics, the media, openness and outreach the participants were treated to an after-dinner Science Art and Writing session at St Andrews Brewhouse in Norwich. The session began with a discussion about communicating with the public and then focused in on specialised communication, something scientists do very well! Writer Mike O’Driscoll then introduced the group to other styles of communication and encouraged them to write poetry to explore new ways of getting messages across. Artist Chris Hann then led an art activity on the theme of plants to encourage creative interpretation and sharing of science. This activity not only introduced new ways of approaching outreach but also gave the scientists time to reflect on the key messages and aims of their work and how they might express that and also sitting around the table exercising their artistic sides led to a vibrant level of creative exchange which was very refreshing. Year 6 pupils at Stapleford Community Primary School (South Cambs) enjoyed an OpenPlant ­ Science, Art and Writing Trust day workshop at the end of January. Scientists Dr. Carlos A Lugo (TSL) and Marielle Vigouroux (JIC), together with SAW Trust coordinator, Dr. Jenni Rant (JIC), artist Chris Hann and writer Mike O’Driscoll, presented their OpenPlant Fund plant electrophysiology project through a series of activities themed around excitable media and circuits of plants, linking them to biological systems like the brain, heart and muscle. The pupils used the Plant SpikerShield system wired up to a Venus flytrap plant and observed the signal when the trap closed. They also had fun working out the optimum time lapse between trigger hair taps for the trap to shut, flexed their muscles to light a bulb, listened to their heartbeat and tested brain signalling with Chinese whispers. With the invaluable help from a professional writer and artist, children were inspired by the science to write some amazing poems and create fantastic pieces of art. The children were very receptive, everyone had lots of fun and the feedback was incredibly positive. A big thank you to Ms Emma Wright, the year 6 teacher, for her warm welcome and her enthusiasm towards the project! ‘In Science, I really enjoyed the reflex activity where we did Chinese whispers and were shining lights into our eyes to see how they react. Also, the venus fly trap was incredible, the way it would close if something tickles the hair inside’. ‘I enjoyed doing the science where I had sensors stuck to my arm, then I would tense my muscles to make the lights go red’. ‘I enjoyed the images of neurons and recreating them with dye, the result was rather satisfying. It was also fun doing the poetry’. The SAW day was fantastic. Throughout the day the children were all engaged with the variety of activities. The children also learnt a lot from the subject specialists that showed their subjects in a new light. Equally the children and teachers alike picked up hints and tips that could be used in the classroom again. I would highly recommend this for anyone. A scene of Africa with a paisley pattern confuses the brain. Tubes linking, waving sea into my brain. OpenPlant exhibited on gene circuits and synthetic biology at their stand at the exciting mid-year conference for the Youth STEMM Award. Around 200 pupils, aged 14­16, from schools around Norfolk attended the event at the John Innes Centre which included exhibits showcasing the science on site as well as a keynote talk from celebrity ethnobiologist James Wong. Read more about the Youth STEMM Award here. The OpenPlant exhibit, run by Nadia Radzman, Don Nguyen and Colette Matthewman, explained gene circuits by comparing them to representative electronic circuits. Example gene circuits were explained to visitors, who then interacted with the electronic circuits and paired them with the gene circuit they represented. This use of electronics represented the concept of synthetic biology as an engineering discipline and opened up conversations around standard parts, components and modularisation ­- key principles of engineering. 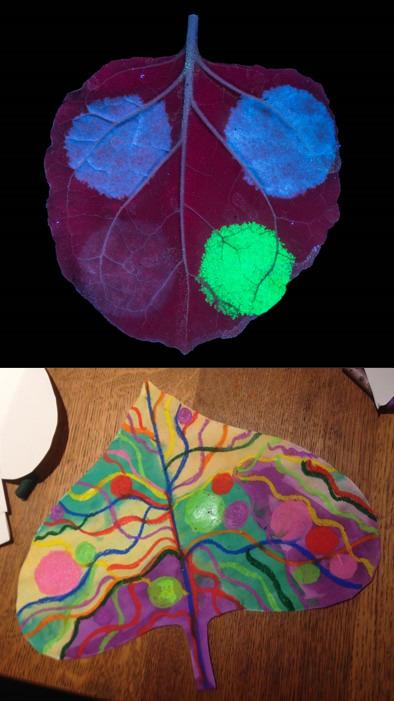 Pupils could also learn how scientists at the John Innes Centre get these gene circuits into Tobacco plants and had a go at infiltrating tobacco leaves (with water containing colouring). Plenty of information about case studies for the use of gene circuits in plants were given to complete the picture of what synthetic biology can achieve. We were very impressed by how well the pupils interacted with the activities. The circuits caught the attention of those with a physics or engineering interest as well as those who were more focused on biology.